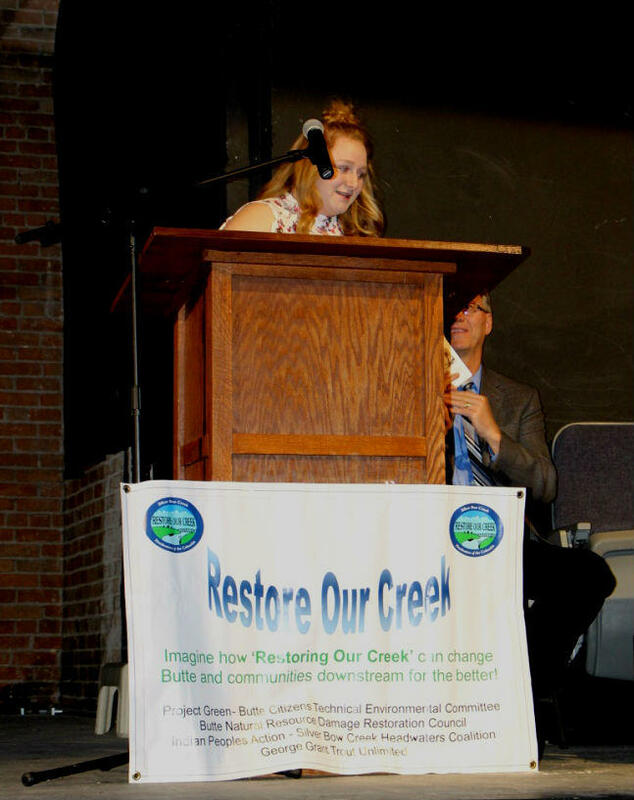 Butte locals gathered at the Covellite Theater Nov. 14, 2017 for a community rally organized by the Restore Our Creek Coalition and the Montana Standard. Tuesday night was cold, but close to one hundred people turned up at the historic Covellite Theater in Butte for the rally calling for clean-up and restoration of the Silver Bow Creek Corridor. That section of Silver Bow Creek runs through the heart of town. After 34 years of Superfund negotiations, it’s still contaminated by toxic mine tailings and smelting waste. Fourteen year old Taryn Stratton was the youngest to take the podium. At fourteen, Butte high school student Taryn Stratton was the youngest speaker who took the stage at the rally in Butte Nov. 14, 2017. "Everyone in this room knows about the buried mine waste along Silver Bow Creek. And to simply plant grass along the top of it and pretend it’s ok would be like me cleaning the house and just sweeping the dirt under the carpet." Stratton was one of 10 speakers at the rally, co-sponsored by the Montana Standard and the Restore Our Creek Coalition. They all expressed a shared sense of anger and frustration at the pace of the clean-up. And they called on the EPA and ARCO to remove the sources of the contamination and finish cleaning up the creek, once and for all. Montana Standard Editor David McCumber said they won’t accept anything less. "Well, we’re here tonight to tell them 'no'. Say it with me! No! Leaving the waste in the ground, the contamination in our water, and a sacrifice zone in the middle of our town is not good enough for Butte," McCumber said. Representatives from the Chamber of Commerce, Butte-Silver Bow County, and local industries, stressed that restoration of the Silver Bow Creek corridor is critical to Butte’s future economic growth and development. David McCumber, editor of the Montana Standard, told the crowd at the rally that Butte residents shouldn't be treated like second-class citizens and he wants to see a complete clean-up of Silver Bow Creek, Nov. 14, 2017. Montana Tech vice chancellor Joe McClafferty and a proud Butte native -- said that Butte’s negative reputation as a dirty town is hampering its ability to attract new residents and business, and reach its full potential. "With Butte, we need to keep the history, but we need to lose that bad reputation. And the first way we do that, is we clean this creek up." Members of the Restore Our Creek Coalition say they'll keep the pressure on the EPA’s new regional administrator, and continue to build momentum for the removal of the Parrot, Diggings East, and Northside tailings.